For those who may not know, jME is the graphics sub-system that Wonderland uses. 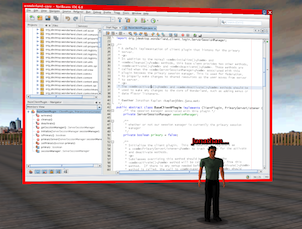 It is a modern 3D game engine written entirely in Java. jME provides core graphics APIs, including graphics primitive and shader support. The Wonderland graphics system is based on these core APIs, with some extensions from MTGame to support multi-threading. 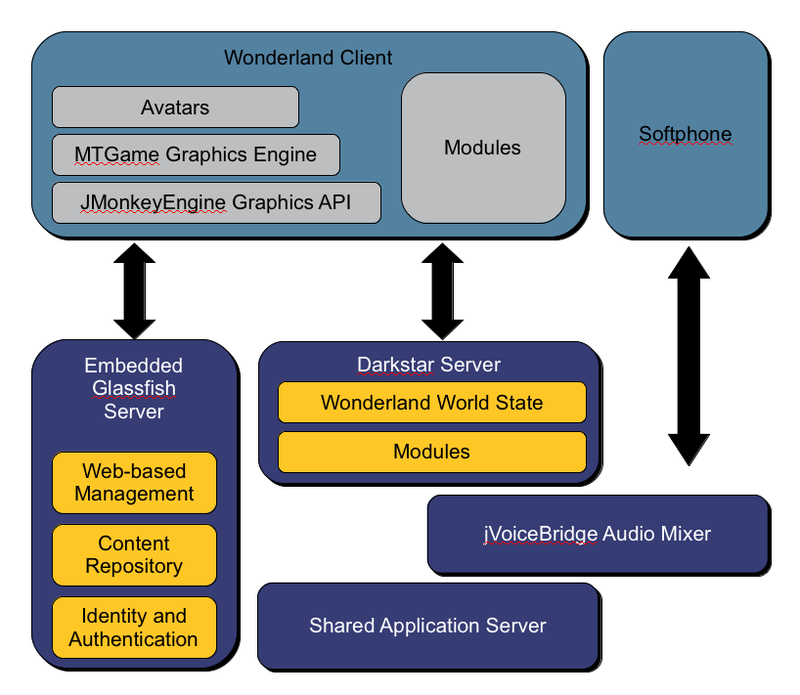 Wonderland APIs - the diagram shows where jMonkeyEngine fits into the Wonderland client architecture. Please put Wonderland Wednesdays on your calendar and plan to join us for one or more of these developer-oriented technical sessions. One of the main goals of these sessions is to help bring more developers up-to-speed on Wonderland development in an informal, highly-interactive environment. If you have ideas for future sessions, or even better, would like to volunteer to run one of these sessions, please add your ideas to the Wonderland Wednesdays Wiki and make a note if you’re willing to lead the session. Yesterday’s impromptu developer session turned out to be a lively and informative session led by Open Wonderland architect Jonathan Kaplan. Open Wonderland developer session on "Using Wonderland with NetBeans"
In this informal technical session, Ryan will lead the group on a walk-through of the sample module code. You might want to browse through the code ahead of time to bring questions with you to the session. Please make sure your Wonderland and audio setup is working before joining this session and also please join the IRC chat so we can get in touch with everyone in case of technical problems. The link above takes you to a web IRC client, but you may prefer to use a program such as Pidgen (all platforms) or Colloquy (Mac). If you plan to join the session, please make sure you have a working headset and test your audio ahead of time. In addition, please join the IRC chat channel in case there are any issues connecting. While the session will be quite informal, the goal is to focus on the topic, so please troubleshoot any connection and audio problems ahead of time. What other topics would you be interested in hearing about? Please post all ideas on the forum. If there are developer sessions you are willing to lead, please volunteer to do that as well. Announcing Open Wonderland – Update Your Bookmarks! Thanks to a huge effort by many, many people in the Wonderland community, I am extremely pleased to announce the birth of Open Wonderland – a fork of the Project Wonderland code. Along with the new open source project, we have launched a non-profit, called the Open Wonderland Foundation, to act as the governing body for the open source project. Here is the press release that explains the transition. The new pages to bookmark are at the end of the post. St. Paul, Minnesota, March 10, 2010 – Today Ken Miller, the CEO of Virtual Learning Labs, announced the formation of the Open Wonderland Foundation and the creation of the Open Wonderland virtual world platform. The Open Wonderland platform is a “fork” of the Project Wonderland toolkit originally developed by Sun Microsystems Laboratories. Miller, who will serve as the Foundation’s first President and Chairman of the Board, explains that the non-profit Open Wonderland Foundation will provide direction and governance for Open Wonderland (http://OpenWonderland.org), a free and open source platform for creating 3D virtual worlds for education, business, and government applications. Others who have indicated they will continue to support Wonderland include Darwin Dimensions, the creators of Evolver (http://evolver.com), a compelling web site for creating avatars, including ones that can be used in Wonderland worlds. AmphiSocial (http://amphisocial.com), a provider of next-generation 3D collaboration and training environments, is also moving ahead with plans to use Wonderland as one of the platforms underlying their new product. Unlike other open source projects that fork, there is no acrimony involved in this instance. On the contrary, the same people who were passionate about Project Wonderland, both from Sun and in the broader open source community, are taking the initiative to advance the technology under the Open Wonderland umbrella. Among the Sun team members transitioning support to the new Open Wonderland project is Wonderland architect Jonathan Kaplan. “Now that we have the new open source project established on Google Code, we’re actively preparing for the next software release,” he reports. “This will be an incremental release that includes some important updates.” Since leaving Sun, other members of the team have been working on new modules to contribute to the Wonderland Module Warehouse – a clearinghouse for both free and commercial Wonderland extensions. In addition to the former Sun employees, a group of dedicated Wonderland open source community members from around the world have pledged to support the new Foundation by donating their time to maintain web sites, create 3D artwork, teach tutorials, provide publicity, and help out in variety of other ways. The Open Wonderland Foundation will be supported by grants, private contributions, and non-profit and corporate donations. To try Open Wonderland, join the open source community, or provide financial support to the Foundation in carrying out its mission of continuing to evolve the Open Wonderland platform, please visit http://OpenWonderland.org. We look forward to your active participation in the Open Wonderland community! You are currently browsing the Wonderblog blog archives for March, 2010.